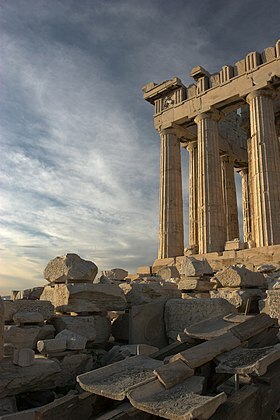 For the longer period of Greek development of which this article's subject is a part, see Ancient Greece. In the Persian court, Alcibiades now betrayed both[clarification needed] by helping Sparta build a navy commensurate with the Athenian navy. Alcibiades advised that a victory of Sparta over Athens was not in the best interest of the Persian Empire. 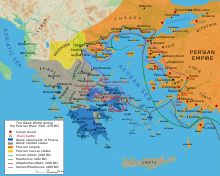 Rather, long and continuous warfare between Sparta and Athens would weaken both city-states and allow the Persians to dominate the Greek peninsula. 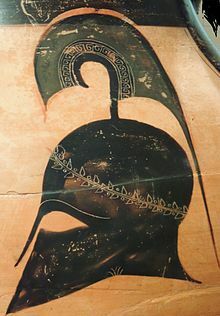 Sparta then built a fleet, with the financial help of the Persians, to challenge Athenian naval supremacy, and found a new military leader in Lysander, who attacked Abydos and seized the strategic initiative by occupying the Hellespont, the source[clarification needed] of Athens' grain imports. Threatened with starvation, Athens sent its last remaining fleet to confront Lysander, but he decisively defeated it at Aegospotami (405 BC). The loss of her fleet threatened Athens with bankruptcy. 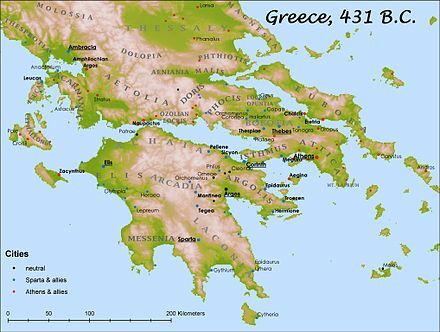 In 404 BC Athens sued for peace, and Sparta dictated a predictably stern settlement: Athens lost her city walls, her fleet, and all of her overseas possessions. 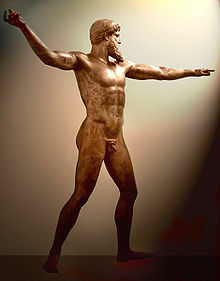 Lysander abolished the democracy and appointed in its place an oligarchy called the "Thirty Tyrants" to govern Athens.